edited by Prof. Henry Jenkins, Prof. William Uricchio, Daniel Pereira, Sheila Seles and Alex Leavitt. What is the Television Audience? The landscape of television technology today is in constant fluctuation. With the development of Internet-based technology combined with broadcast television – everything from the DVR to IPTV to Over The Top (OTT) options like Netflix and YouTube – the options for television distribution and consumption are numerous and fragmented. The television audience also has experienced fragmentation, across cable networks (Napoli 2003) and now away from traditional broadcast schedules, turning instead to online options like Hulu. So how do we define the television audience in an era of chaos? The television audience has been conceptualized along various theoretical and practical lines. Both Ang (1991) and Mosco (1996) argue that the television audience is a product of the industry, lacking any social context beyond demographic groupings. Ang (1991) notes that, over twenty years ago, characterized through a representative ratings system, the actual viewers watching television were invisible conceptually and technologically to the television industry. In a much different televisual area, today it is more valuable to look at practices like information sharing to define audiences. While the industry has adopted more detailed studies, such as the use of focus groups to calibrate concepts, examining practices invokes further theoretical issues. Lunt and Livingstone (1996) question whether the audience should be defined as a group of individuals that share common behaviors of watching TV or as a collective that engages with one another. If characterized by group dynamics, Livingstone (1998) also asks if the audience represents a unified group or a diverse set of subgroups. In response, I approach the label of “audience” as a malleable category that encompasses varying behaviors yet unifies diverse participants around media and information while moving beyond statistical extrapolations and outdated abstractions. The ratings systems that dominate the television industry fix the television audience as a group that exhibits one behavior: watching television programming. However, media audiences actually exhibit a range of practices beyond mere viewing, such as evaluating media, discussing topics socially, generating content, sharing information, attending fan events, and even leaving the room during a TV show. While the concept of television audiences as constructed by television ratings remains valuable for certain purposes, it does not account for the diverse range of behaviors in which audiences participate. These other behaviors beyond simply watching television are valuable for understanding how and why viewers connect with and mobilize around media content, providing more productive feedback about audience interest and value. This C3 research memo aims to address the expressive and participatory practices of online television audiences. Television audience participation online has been radically shifting to new forms of practice over the past decade as more and more users interact with the Web and other Internet-connected services. Prior to these recent trends, most participation online revolved around television “communities,” where fans primarily interacted with other fans. However, with the rise of social network sites, viewers are constructing a more-social ecosystem that will affect how current and future audiences engage and identify with television content. Rather than a group of likeminded strangers, users on social network sites (SNS) are connected to others they know. Likewise, SNS provide opportunities to perceive trends across large populations and wide ranges of viewers. By mapping out the evolution of television audiences’ participatory spaces and practices, this memo outlines the evolving technical and social ecosystem that mediates audience participation online. 1. Early online television communities formed around shared interests in specific online spaces. 2. The development of social network sites (SNS) helped different social behaviors emerge online because of increased visibility and accessibility of users. 3. While SNS do not represent the only online platforms where television audiences reside and interact, they can be excavated to extract significant, previously unavailable data and trends. 1. Evolution of Platforms: The industry must recognize that platforms will evolve and change, and while design will subtly reshape behaviors, social participation should remain constant. The industry must therefore be ready to evolve with the Web and be ready to engage consumers with flexible media experiences that cater to, rather than suppress, these social practices. 2. Recommendation Systems: The availability of widespread social networks, especially integrated with media viewing devices, allows the industry greater opportunities to engage with networks of consumers, rather than simply individuals. Recommendations systems are one area where these networks can be exploited to help deliver content, spread awareness, and reinforce brand identity, while providing the industry better systems to measure consumer engagement online. 3. Global Ecosystem: With more users online than ever before, the industry should push to make its content as widely available as possible. As social networks span global markets, so too should companies embrace global distribution, allow television content to spread across those vast networks, and aim to broadcast simultaneous worldwide releases. Alex Leavitt is a doctoral student in Communication at the Annenberg School for Communication & Journalism at the University of Southern California. His primary research focuses on alternative uses of social media, networked communication, and Internet culture. On the side, he studies digital transnational fandom around Japanese pop culture. Prior to USC, Alex was a research assistant to danah boyd at Microsoft Research New England. 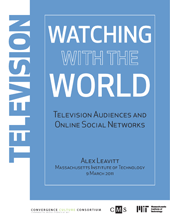 He also researched with the Convergence Culture Consortium, where he wrote "Watching with the World: Television Audiences & Online Social Networks". Additionally, Alex has served as a Lead Researcher on the Web Ecology Project and has worked with the Berkman Center for Internet & Society at Harvard University. Alex has written frequently for the Futures of Entertainment blog, and he writes long-form about his research at The Department of Alchemy blog. He can be reached via email at alexleavitt@gmail.com and on Twitter @alexleavitt.